Will Lashley ever go full MMA in the WWE? Bobby Lashley's run in the WWE has been pretty underwhelming, to say the least. He may have the Intercontinental title strapped around his waist but a lot more was expected from the former ECW Champion when he returned to the company after ten years. Lashley's story in his latest WWE run could have been very different had WWE gone through with an idea that he had pitched. American Top Team MMA Gym Founder Dan Lambert spoke to James Lynch of Fightful and revealed Bobby Lashley's intentions of carrying over some of his MMA traits to the WWE. Lashley began wrestling in 2004 and was signed up by the WWE to a development contract in the same year. Despite having the look and the athletic capabilities of being a top talent, Lashley's first stint was seen as a relative failure. He did, however, win the ECW World Championship, Intercontinental Championship, and the US Championship during his 4-year stay with Vince McMahon's company. The Dominator would turn his attention towards setting up an MMA career soon after getting released from WWE in 2008 and would go on to compete for many top promotions such as Strikeforce and Bellator MMA, amassing an impressive overall record of 15 wins and 2 losses. He even had a successful run in TNA until 2018, where he won the TNA World title on four different occasions. The latter half of his time in TNA saw him incorporate his MMA background in storylines as his teammates from American Top Team, including Dan Lambert, interjected themselves in various angles. Lambert stated that he was a fan of Lashley's MMA angle in TNA and knows for a fact that the WWE IC Champion wanted to bring it to the WWE too. However, it seems the WWE management wasn't too high on the idea as we haven't seen any signs of the potential character being implemented on TV. Lambert, though, sounded optimistic about WWE possibly revisiting the TNA gimmick, which would enable his team to show up on WWE programming someday. The American Top Team head even shared his thoughts on the WrestleMania 35 card, such as the Raw Women's title match, Kofimania, and Orton vs. Styles. Lashley is expected to defend the Intercontinental title in a multi-man match at WrestleMania 35. While he has been underutilized thus far, he is only in his second year as part of his renewed WWE stint and there is still time for things to change for good. WWE News: WWE accidentally confirms return for WrestleMania 35? 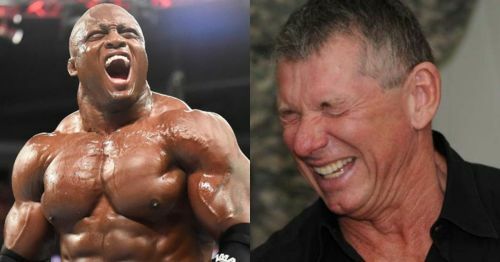 What if Brock Lesnar was Facing Bobby Lashley at WrestleMania 35? WWE News: 42-year-old Superstar to finally have dream match against Brock Lesnar after WrestleMania loss?